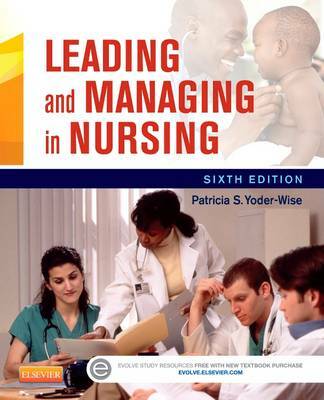 Leading and Managing in Nursing, 5th Edition, by Patricia Yoder-Wise, successfully blends evidence-based guidelines with practical application. The new edition is designed to prepare you for the nursing leadership issues of today and tomorrow, providing just the right amount of information to equip you with the tools you need to succeed on the NCLEX and in practice. This thoroughly updated edition is organized around the issues that are central to the success of professional nurses in today's constantly changing healthcare environment, including patient safety, workplace violence, consumer relationships, cultural diversity, resource management, and many more. UNIQUE! Each chapter opens with The Challenge, where practicing nurse leaders/managers offer their real-world views of a concern related in the chapter, encouraging you to think about how you would handle the situation. UNIQUE! The Solution closes each chapter with an effective method to handle the real-life situation presented in The Challenge, and demonstrates the ins and outs of problem solving in practice. The Evidence boxes in each chapter summarize relevant concepts and research from nursing/business/medicine literature. Theory boxes highlight and summarize pertinent theoretical concepts related to chapter content. Research and Literature Perspective boxes summarize timely articles of interest and point out their relevance and applicability to practice. Separate chapters on key topic areas such as cultural diversity, consumer relationships, delegation, managing information and technology, legal and ethical issues, and many more. End-of-chapter Tips offer guidelines for applying information presented in the chapter. Numbered exercises challenge you to think critically about concepts in the text and apply them to real-life situations. Eye-catching full-color design helps engage and guide you through each chapter. Glossary alphabetically lists and defines all the boldfaced key terms from the chapters. Chapter Checklists provide a quick summary of key points and serve as a handy study tool. NEW! QSEN competencies incorporated throughout the text emphasize the importance of providing safe, high-quality nursing care. NEW! What New Graduates Say section at the end of each chapter provides you with a real-world perspective on the transition to clinical practice. NEW! Expanded content on legal and ethical issues, care delivery strategies, staffing, quality, and consumer relationships. NEW! Updated photos throughout the book maintain a contemporary and visually appealing look and feel.